I believe that just about everyone is aware on some level of the significance (or not) of December 21, 2012. That is the date, according to the Mayan calendar, on which the world as we know it will end. This is either prophesied by the calendar or intuited by same, depending on with whom one speaks or what one reads. As a result, it has been the subject of numerous films and books, and even series of novels, dealing with the run-up to the date and the morning after, such as it may be. With 12.21, Dustin Thomason --- whose credits include co-authorship of THE RULE OF FOUR with Ian Caldwell --- has put a bit of an ingenious twist upon the entire controversy. The conclusion will leave you thinking and perhaps worrying just a bit. 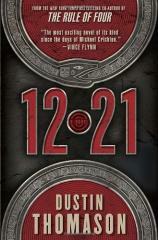 "With 12.21, Dustin Thomason...has put a bit of an ingenious twist upon the entire controversy. The conclusion will leave you thinking and perhaps worrying just a bit.... Whether you are buying into the Mayan calendar doomsday scenario wholeheartedly or not, 12.21 is worth considering." Most of the theory behind the general December 21st panic has to do with the reversal of the earth’s magnetic fields occasioned by something else, with the result being that, among other things, my android phone won’t work. Thomason’s take is a bit more grounded. The novel commences on December 11, 2012, with the discovery in Los Angeles of what is believed to be a prion disease with symptomatic fatal familial insomnia. The patient X in this case is a gentleman who appears to be of Central American origin. At approximately the same time, Chel Manu, a Guatemalan researcher at the Getty Museum, obtains possession of an ancient codex that, remarkably enough, originated in a lost city of her ancestors. It is an artifact that should not exist, yet it appears not only to be genuine but also to reveal why the Mayan kingdoms vanished seemingly overnight. What Manu does not realize is that she and the city of Los Angeles are only a couple of days away from getting a really good and modern look at what occurred. What is initially thought to be “mad cow disease” turns out to be an extremely deadly contagion that quickly infects the population of the Los Angeles area and spreads outward. Dr. Gabriel Stanton, an expert in the identification and etiology of prion diseases, races against time to the jungles of Guatemala in hopes of discovering the “ground zero” of the disease that has inexplicably jumped to Los Angeles and will almost certainly decimate the population of the contiguous United States --- and beyond --- unless a cure is found quickly. It appears that Stanton has only a few days, and this question hovers over his desperate gambit: Is this the disaster predicted by the Mayan calendar? 12.21 presents a frightening set of circumstances and what is perhaps the ultimate in “ticking clock” scenarios. While the execution is a bit heavy-handed at times (the pages of translations from the codex that pepper the book could easily have been left on the cutting room floor), the overall plot behind the story makes it worth reading. Those who enjoy their beef and pork --- myself included --- will find the tour of a meat processing plant that occurs in the opening chapters particularly interesting, and the ins and outs of the transmittal of contagions that are described in fascinating detail here will provide justification to those germaphobes who keep the hand gel at the ready when out in public. It is a testament to Thomason’s descriptive powers that I have joined their ranks, at least temporarily. Whether you are buying into the Mayan calendar doomsday scenario wholeheartedly or not, 12.21 is worth considering.